To Cite: Ilerisoy Yakut Z, Yagmur Bas A, Turan A, Demirel N, Hakan Demirkan T. Early Sonographic Diagnosis of Neurocutaneous Melanosis in a Newborn, Iran J Radiol. 2014 ; 11(4):e10107. doi: 10.5812/iranjradiol.10107. Neurocutaneous melanosis (NCM) is a rare, congenital non-hereditary syndrome, characterized by multiple pigmented nevi. We report the radiologic findings of a newborn who had extensive cutaneous melanotic nevus with satellite lesions in the brain. Ultrasound showed multiple echogenic foci in the cerebral parenchyma. 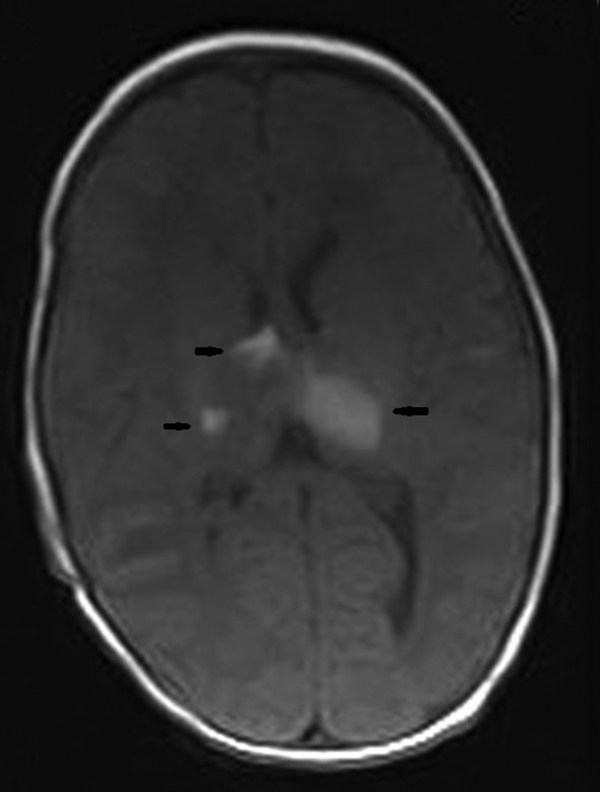 Subsequent MRI confirmed these lesions as characteristic deposits of melanin. The infant was asymptomatic, but presence of risk factors such as malign transformation or neurological manifestations makes early diagnosis very important. 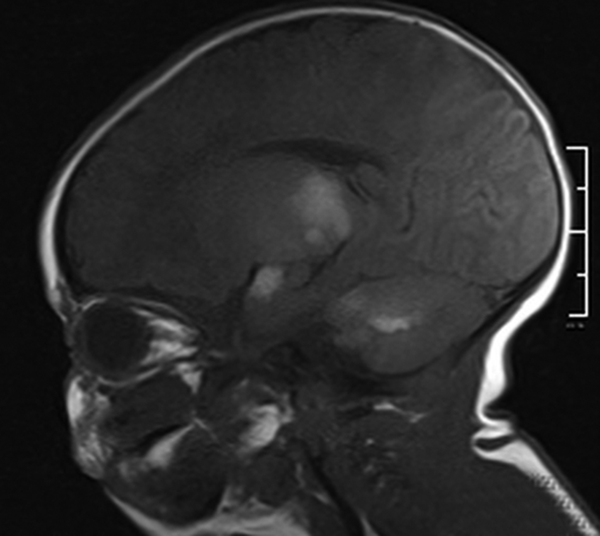 We present this case to emphasize on the radiological findings of this syndrome in order to reach an early diagnosis. Neurocutaneous melanosis (NCM) is a rare, non-familial, congenital syndrome, first described by Rokitansky in 1861(1). It is also named Touraine syndrome. In this syndrome, multiple (three or more) or large congenital nevi (measuring equal to or greater than 9 cm on the scalp, or 6 cm or greater on the body) with melanin-containing cells in the leptomeninges (melanosis or melanoma) are accepted as the diagnostic criteria (2). The giant congenital melanocytic nevi (GCMN) occurs in approximately 1/20.000 of the live births (2). The incidence of central nervous system (CNS) involvement in GCMN is unknown. Recently published estimates of the incidence range from 7% to 24% (2). The prognosis is extremely poor when patients become symptomatic or when neurological manifestations appear. CNS involvement is basically diagnosed by imaging, especially by MRI. In this report, we present a neonatal female with GCMN and CNS melanosis. Brain lesions were primarily diagnosed by cranial ultrasound (US) 3 days after birth. Subsequent MRI confirmed ultrasound findings and revealed the extent of neural involvement. A female infant was born in our hospital by vaginal delivery at 39 weeks of gestation to a primiparous 21-year-old mother who had not received prenatal care before delivery. Giant and multiple black cutaneous lesions were identified immediately after her birth. Her parents were healthy and no family history was present. The largest nevus covered nearly the entire back (21×15 cm) extending inferiorly from the upper back to the buttocks and anteriorly to the trunk, wrapping the lower abdomen and proximal thigh. It was smooth and not covered by hair. A few hundreds of satellite lesions, 1 mm to 5 cm in diameter, were scattered over the body, scalp and extremities (Figure 1). The birth weight was 2870 gr, the head circumference was 32 cm and the total body length was 49 cm. Her neurological examination was normal. Cranial US was requested to see whether cranial lesions were also present. Cranial US (GE Healthcare's LOGIQ® P5 portable ultrasound system), which was done via the anterior fontanelle from coronal and parasagittal views, demonstrated bilateral, multiple echogenic intra-parenchymal lesions with smooth margins. These 4-24 mm in diameter lesions were present in both temporal lobes, the basal ganglia and the white matter of the cerebellum (Figure 2). Based on the US findings, MRI of the brain and the spine was performed. The examination was performed on a 1.5 Tesla MRI equipment (Philips Best The Netherlands) with the following sequences: sagittal MPRAGE, axial TSE T2, axial echo planar, diffusion tensor imaging, axial T1-weighed (T1W) images before and after contrast (gadolinium dimeglumine-magnevist) as well as enhanced coronal and sagittal T1W images of the brain. T1W enhanced images of the spine were also obtained. The brain images revealed multiple lesions. Leptomeningeal involvement was easily seen on T1W images as gyral hyperintensities, especially in the parieto-occipital sulci and subarachnoid spaces. It was not thick, plaque-like or nodular, which was a feature of benign involvement. Figure 2. Coronal US of the brain via anterior fontanelle using the linear array transducer demonstrates two well-defined echogenic foci in the basal ganglia; the biggest, 23×16 mm in diameter is located in the left thalamus. Parenchymal involvement appeared as multiple nodular lesions involving the dentate nucleus bilaterally, the right cerebellar hemisphere peripherally, the right internal capsule, left thalamus, medial temporal lobe bilaterally, right middle cerebellar pedicle, left frontal lobe, parieto-occipital sulci and subependymal regions characterized by hyperintensities on T1W images and low signal on T2W images (Figures 3-6). 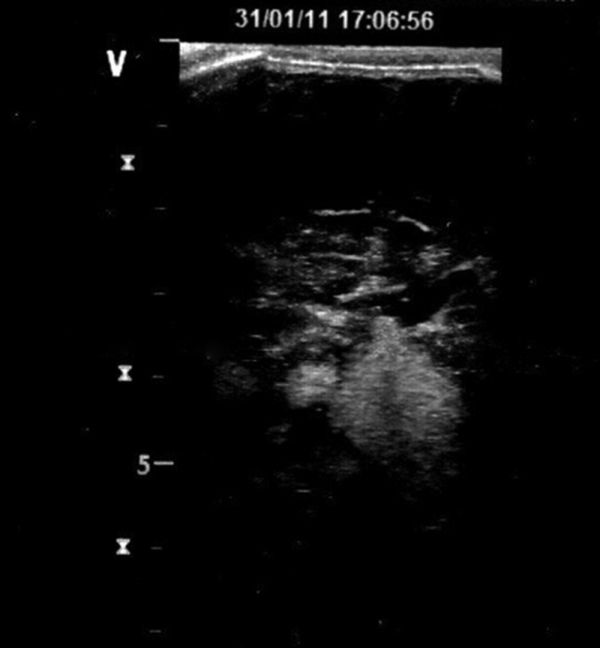 The lesions were easily seen on T1W images and they did not enhance significantly. The biggest lesion was located on the left thalamus that was also easily seen on US examination. The spinal MRI was normal. The patient is healthy without seizures and followed up by departments of pediatric neurology, dermatology and plastic surgery. Figure 3. Sagittal midline T1W image reveals multiple foci of high signal intensity involving the basal ganglia, temporal sulci and cerebellum. Figure 4. 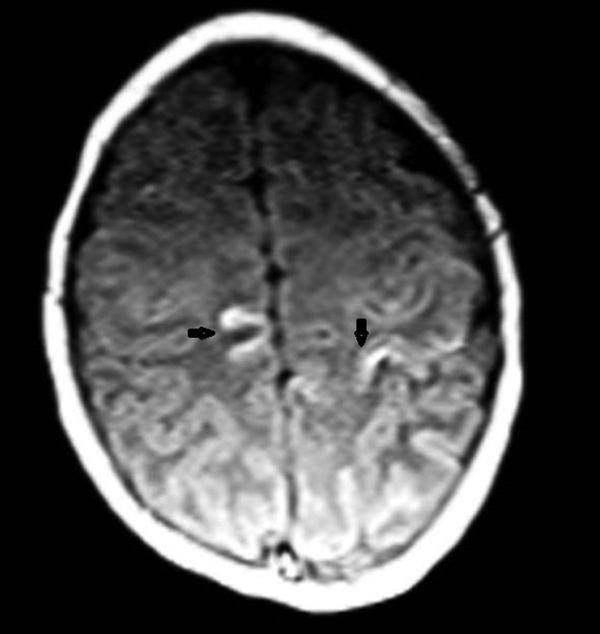 Axial T1W MRI without contrast shows hyperintensities in the parietal sulci indicating leptomeningeal involvement. Figure 5. Low signal intensities on coronal T2W image suggests melanocytic cell deposits in the bilateral thalami. Figure 6. Axial T1W MRI without contrast confirms the bilateral thalamic lesions that were seen on US. The lesions (arrows) resulted in T1 shortening. Patients who have large cutaneous lesions particularly over the back, neck or scalp and multiple (more than three) nevi have been shown to have a greater risk for neural involvement (3). The present case had large cutaneous lesions especially over the back, which is a risk factor for CNS melanosis. So we performed cranial ultrasound even though the infant was asymptomatic. These infants have been defined to have normal physical examination except for skin lesions at birth (2). 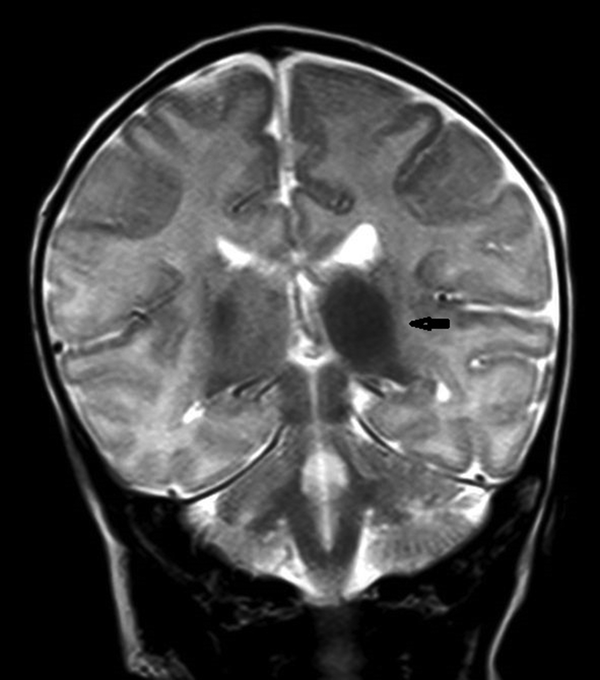 But in the first two years of life, the patients with intracranial lesions show neurological manifestations of increased pressure due to poor resorption of the cerebrospinal fluid (CSF), mass lesions or spinal cord compression (2).These abnormalities typically manifest as seizures, hydrocephalus, developmental delay and delay of motor movements (2).Symptomatic CNS melanosis, even in the absence of malign transformation, has an extremely poor prognosis (2). It is important to diagnose the cranial lesions at birth if present, since it helps to diagnose the clinical manifestations earlier. Although CNS melanosis is best seen on MRI scan, ultrasound is useful in newborns for early diagnosis due to the availability and ease of use. In our case, lesions were echogenic with smooth borders and without a mass effect. Echogenic foci in the brain parenchyma may be seen in some pathologies such as tuberous sclerosis, candidal infection and petechial hemorrhage. The diagnosis can be made by clinical features. CT may also show iso-hyperdense intracranial lesions. In the present case, we did not perform CT since MRI was available. Definitive diagnosis of neural involvement is made by identification of melanocytes by CSF sampling or meningeal biopsy. However, in practice, craniospinal lesions seen on MRI of a baby with cutaneous nevus highly suggests NCM. Melanin deposits in the brain usually lead to severe shortening of T1 relaxation time due to the paramagnetic effect. It was revealed to be the result of the presence of stable free radicals in melanin (4). Lesions are typically hyperintense on T1W and hypointense without associated edema on T2W. Large lesions may show local mass effect. Gradient echo sequence may show a focal blooming or susceptibility artifact due to the presence of melanin and hemorrhage (5). In this case, US was used to show whether cranial lesions exist, but MRI was superior to US since it showed leptomeningeal involvement and also the extent of cranial lesions. In US, we could not see very small lesions in the cerebellum because of bone artifact. In NCM, melanocyte deposition can be found in the pia and arachnoid, most commonly over the base of the brain, in the basal ganglia, dentate nuclei, cerebellar hemispheres, pons, thalami, amygdala and basal frontal lobes (6). In addition to intracranial leptomeningeal involvement, intraspinal leptomeningeal, ventricular ependymal and choroid plexus involvement may occur. The true incidence of spinal involvement in patients with melanocytic nevi is unknown, but in some reports spinal involvement was revealed to be 20% of the cases (1). By MRI imaging, the spectrum of neural involvement can be understood. Knowing these locations helps to differentiate melanotic deposits that are part of the disease, from metastases secondary to malignant degeneration of a GCMN. It is not always possible to differentiate primary malign melanoma from metastatic lesions by MRI. The usual appearances of metastatic malignant melanoma on MRI include the melanotic and amelanotic patterns. The melanotic pattern consists of high signal intensity on T1W and low signal intensity on T2W images. In the amelanotic pattern, the lesion is hypointense or isointense to the cortex on T1W images and hyperintense or isointense to the cortex on T2W images. Cerebral lesions were more common than cerebellar lesions. Primary melanoma in the CNS is very rare. Primary melanoma does not always have a homogeneous pattern on MRI; its appearance may depend on the degree of melanin or previous hemorrhage within the lesion. It is usually hyperintense on T1W and iso- to hypointense on T2W with contrast enhancement. NCM may also show malign transformation. Focal nodular or thick plaque-like meningeal enhancement and contrast enhancement of intracranial lesions may represent malign transformation (4). Additionally, any growth of pre-existing lesions, edema or necrosis in the lesions is suspicious of malignant transformation (2). In our case, no enhancement was observed. The overall incidence of malignancy within the involved meninges is estimated to be as high as 50% (7). Although absent in our patient, tethered spinal cord, syringomyelia, and structural abnormalities, particularly Dandy Walker malformation, encephalocele, arachnoid cysts, and Chiari type 1 malformation have been reported to be associated with NCM (8, 9). The pathogenetic mechanism causing accompanying brain malformations is associated with leptomeningeal melanosis. The exact pathogenesis of the association of Dandy Walker complex (DWC) with NCM is unknown. However, the most widely accepted hypothesis is that leptomeningeal melanosis prevents the normal inductive effects of primitive meningeal cells on the deposition of extracellular matrix, neuronal cell migration, and formation of normal basal CSF resorption pathways, thus resulting in the vermian hypogenesis and retrocerebellar cyst formation characteristic of DWC (10). CNS melanosis has no specific treatment at present, but its early detection prevents aggressive surgical treatment of cutaneous lesions. A child with CNS melanoma on initial scan, as in the present case, must be examined every 6 months regularly for neurological signs by serial MRIs to detect malign transformation. Early detection of a CNS malignancy enables surgical resection of the tumor. In conclusion, our case is an example of one of the earliest sonographic detections of NCM. There are not so many cases like this in the literature, in which the diagnosis of NCM is made by US in the first days after birth. In our case, intracranial lesions were disseminated and bigger in size compared with the other cases in the literature. The cutaneous lesion in our case was also huge with multiple satellite lesions. Authors’Contributions: Zeynep Ilerisoy Yakut performed the ultrasound examination and wrote the manuscript.Aynur Turan helped prepare the images. Ahmet Yagmur Bas wrote the case part of the manuscript.Nihal Demirel gave the information about the baby’s clinical progress. Tulin HakanDemirkan and Aynur Turan interpreted the MRI images and wrote the MRI findings of the baby in the manuscript.